B. 5 Dec 1715 at Kettle Parish, Fife Ref. D. 28 Jan 1780 at Compton Bassett, England Ref. D. 4 Oct 1771 at Compton Bassett, England Ref. His father, David died two years after James left Oxford. James then succeeded to the family estates. In the Indices of the Retours (General Index, 28) James Pitcairn of Forthar is mentioned as being served heir to his father David Pitcairn of Forthar, who died 3rd June 1739. Heir special in the lands, Barony and Manor-place of Forthar, in the Parish of Kettle, Fifeshire, dated 25th September and recorded October 1740. 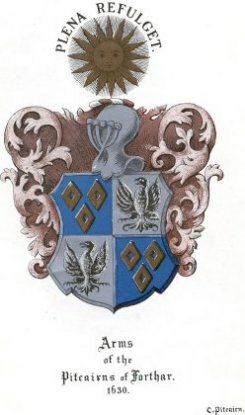 (Also No.32) James Pitcairn, Clergyman at Cloon, Longfoord, in Ireland, only son of David Pitcairn, late of Forthar, brother-german of Marion Pitcairn, to his aunt the said Marion Pitcairn, wife of William Bawen of Kinnittles, heir in general, dated 10th and recorded 17th January 1759. The Rev James Pitcairn therefore was declared heir to Forthar; but the Pitcairns were ardent Jacobites, their estates of Forfar and Dovan were probably forfeited in 1745, as Pitcairn was in 1715. The estate had to be sold on the 23rd Feb. 1756, when it passed into the hands of Dr Stewart Thriepland, who evidently bought it back for Dr William Pitcairn. James Pitcairn of Forthar succeeded, therefore, to many difficulties and much embarrassment, which is easily understood, for, if his father were heavily fined for his opinions and Jacobite leanings, so that the estate had to be sold in1756, David must have left little spare cash for his son and heir. James left Oxford in 1737, and before 1749 he had left Scotland for ever. He went to Ireland, and was appointed rector of Cloon near Longford. He wrote from there to his great friend, a Dr Middleton, who it appears helped him in his difficulties. They are pathetic letters, and wonderfully cheerful, considering he had lost his patrimony, was exiled from his old home, and much hampered by small debts, which were a great trouble to him. However, brighter times were in store for him, and in 1759 he was appointed to the livings of Compton Bassett and West Kington, in Wiltshire, and his hard struggles were then over. Later on he was made Prebendary of Exeter. He married Elizabeth, daughter of Sir------ Axford, a Gloucestershire baronet. After he went to live at Compton Bassett, he was made Prebendary of Exeter Cathedral. The Pitcairns had ten children. Elizabeth Pitcairn, wife of the Rev. James Pitcairn, then Rector of this Parish was buried in the Chancel about three feet distant from the North Wall.